Barn & Stable Supplies > Buckets, Tubs, Feeders, & Tanks > Feeders > Fence Feeder > Plastic Better Bucket 10 Qt. 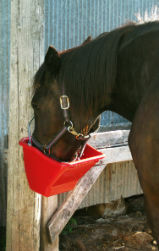 Patented ergonomically designed feeder is excellent for horses, cattle, and livestock. Angular design better accommodates animal's facial structure, allowing more natural eating manner. Tapered sides funnel feed toward back of bucket which makes feed and grain more accessible and reduces animal behavioral problems. Flatback provides stability against a wall or fence. Fits on a flat wall with h either a traditional wall bracket or snap hook. Durable, impact resistant, high-density polyethylene construction with smooth finished edges and heavy-duty handle.